When it's your Fathers Birthday show him you care with a card especially for him. We all like to send cards to our Mum for any occasion, but don't forget that your Dad has a birthday too. And he also deserves to be remembered with a special greeting, and there is none more special than a card that you have made yourself. Female card ideas are easy to come up with, coz mostly they like girly things like flowers, ribbons and pearls. And so a bit of added glitz and sparkle can give them a card that has the "Wow" factor. 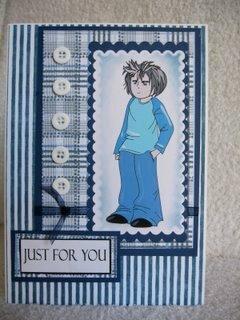 But male cards are notoriously hard to think of and it is something most crafters struggle with. This card is as masculine as I could possibly make it ... well it is for me as I like to add all sorts to my cards !! Here is another one using some trendy stripy paper. It uses a combination of things to keep it masculine. 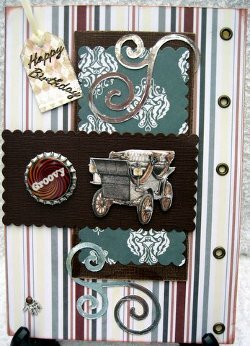 I have used eyelets along the right hand side in brown to match the card, and added a cardboard tag in the top left corner with the sentiment on it. 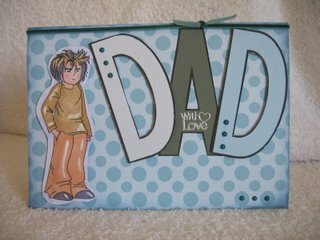 Very smart for the Dad in your life is this easy panel card. The colours are masculine and the layout is simple.